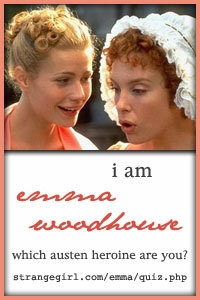 I do love Jane Austen and one of my favorite characters of hers is Emma Woodhouse!!! I actually have never read any of her books (gasp) but do love the movies and have seen them countless times. Sense and Sensibility, Emma, and Pride and Prejudice are my favorites. You are Emma Woodhouse of Emma! You like being the queen of your social circle (small and provincial as it may be), and feel it's your duty to help those less influential than you. You often meddle in the affairs of others, though you do it with a pure heart. You are often deluded in your flights of fancy, but your good intentions and creative spirit make you someone anyone could like. So take this quiz and tell me which character you are!! I am Elinor Dashwood. No big surprise i guess. So YAY i get Hugh Grant! I'm Elizabeth Bennett of Pride and Prejudice. Yes! I love that character!